Artists who work from direct observation have a special way of looking at their subjects, a darting glance that picks up impressions the way a janitor’s litter spike snags trash. 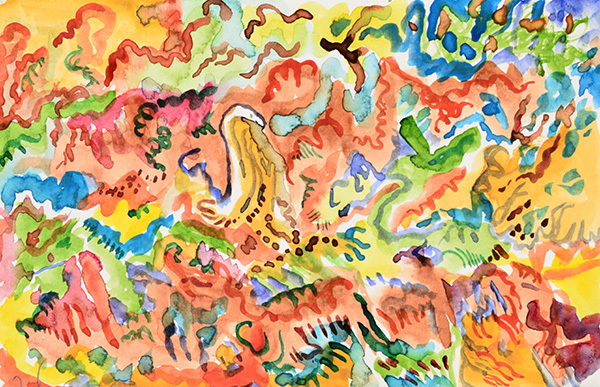 Nearly every action that builds up the drawing or painting follows from one of those quick looks. You look and make a mark, look again to refine the mark, look again to find the spatial relation of this to that, look for angles, look for curves, look for shades and colors, look to compare, look to correct. You’re constantly comparing your sketch to your model, translating perceptions into marks, trying to see better and capture better all the time, and racing the clock. In a classroom full of artists of mixed levels of experience, you can pick out the ones that know what they’re doing by watching how they look: how efficient and focused is their glance, and how frequently they look between their paper and the model. 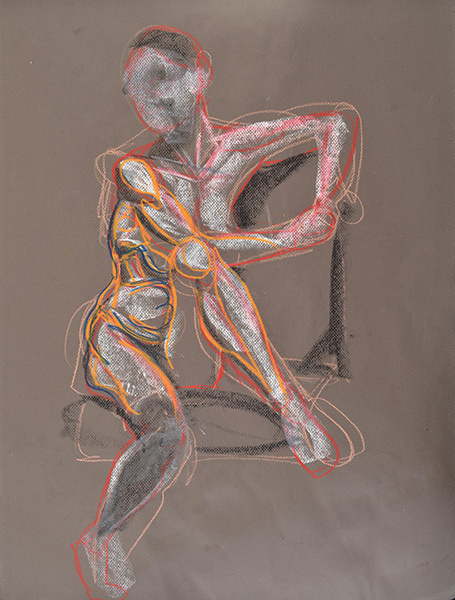 These artists are drawing at Minerva Durham’s Spring Studio in New York, a drawing studio that attracts the most dedicated practitioners of drawing from the live model. 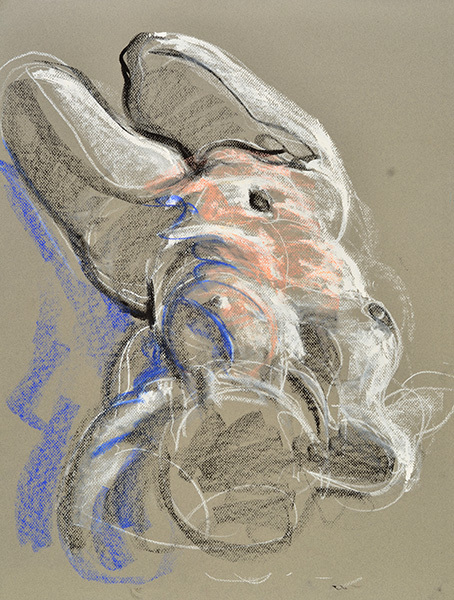 If you were to observe a drawing session at Spring Studio, you’d probably be struck first by the quiet intensity of the whole group of artists. 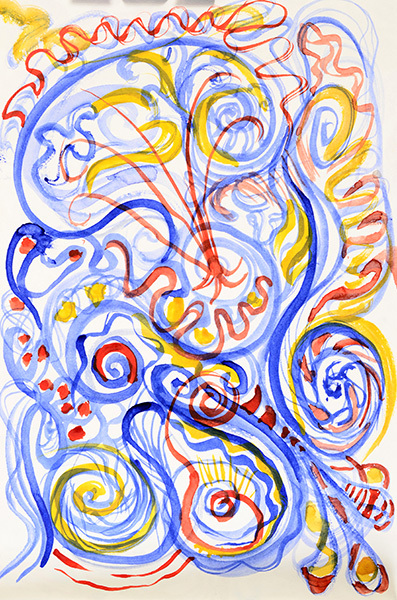 There is no music, no talking, just the single-minded focus on seeing and drawing. 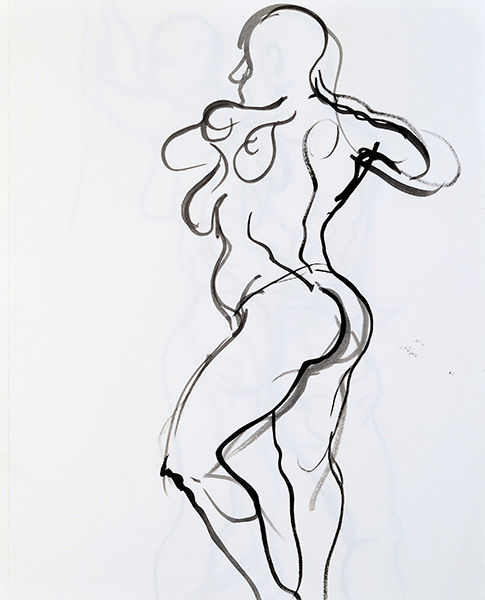 In quick poses my glances are looking for overall forms, trying to see the figure as an arrangement of curves in space. 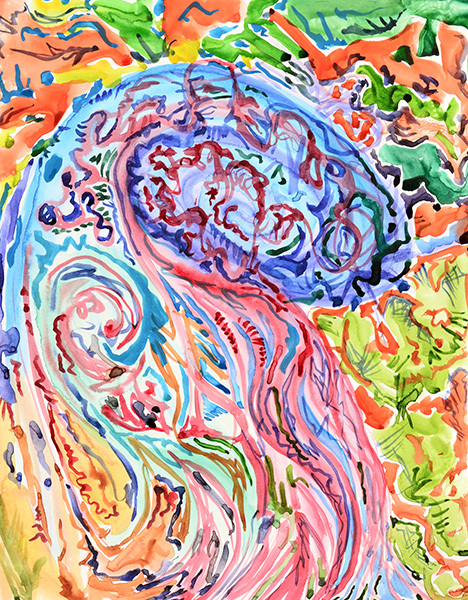 In the crayon drawing above, I made a first rough pass in magenta, then refined my contours in a bolder blue. 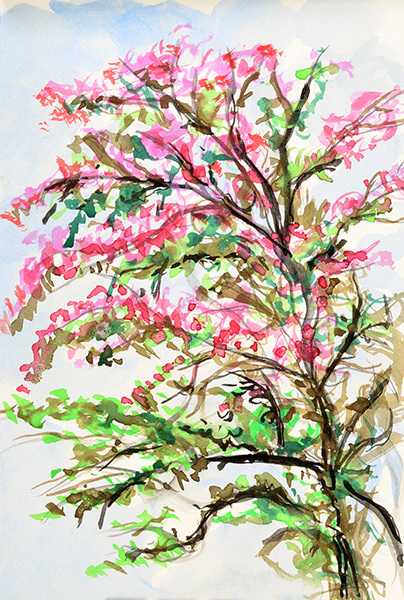 There was probably a glance for nearly every separate stroke in the drawing. The sketch below is done with a brush and black watercolor. The individual strokes are easier to distinguish here. I see the curve of the shoulder and that becomes a brush stroke, then glance at the breast and make that curve, then at the belly and make that curve, and so on. Each marking has a certain rhythm and motion that reflect a quick tracing of that particular contour in my perceptual system. Constant practice improves the speed by which we receive such perceptions. Each moment of seeing is translated into a movement of the hand. 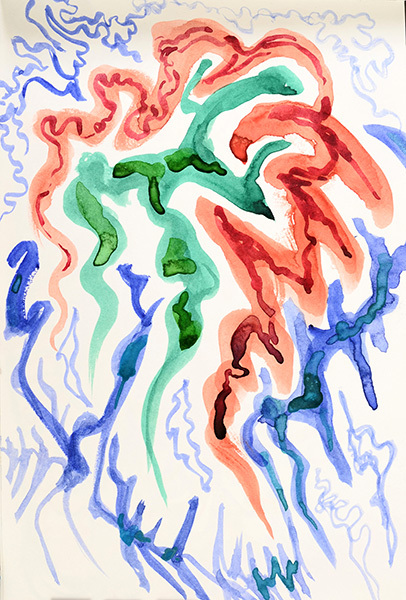 The resulting marks reflect the quality of these movements, and thereby trace a record of the act of vision, a series of impressions made as the artist experiences them. 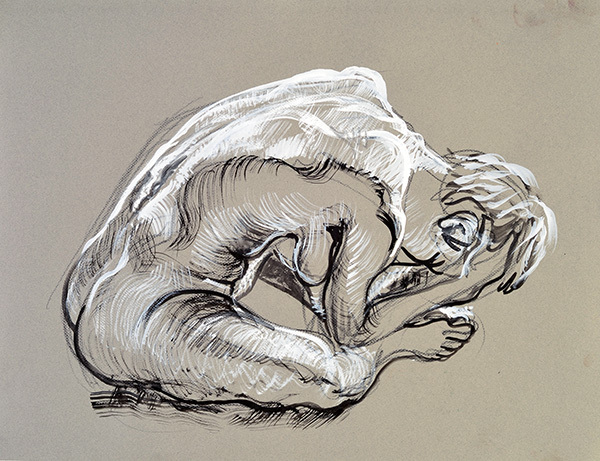 Drawing is not simply a copying of contours, but a trail left in permanent marks as the mind examines a scene over a particular period of time. Seen this way, it is clear that drawing captures something that photography does not. A camera, like an NSA surveillance program, indiscriminately vacuums up every detail of light information in its range. A drawing artist is more like a murder-mystery detective, following all the trails, picking up clues, details, impressions, until a coherent picture emerges from the process. 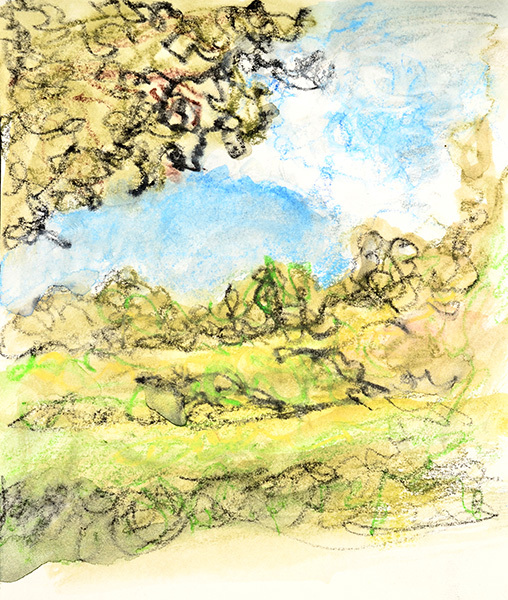 Photography is a mechanical scan, while drawing is an active, responsive exploration of a scene. The distinction is between intelligence gathering and intelligent gathering. The drawing medium affects how I see. When I am holding a pencil, as in the sketch above, I see the scene in terms of lines. 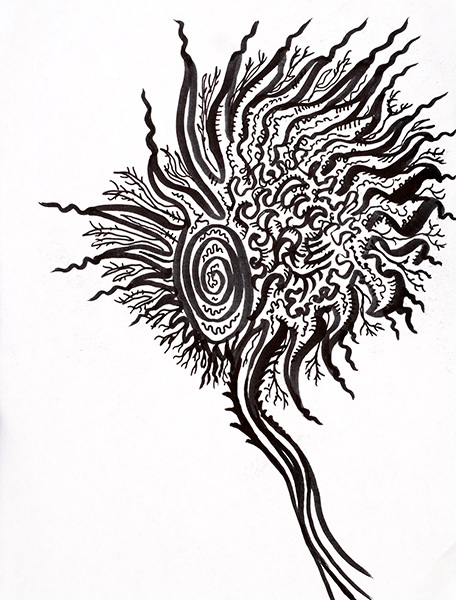 When I use a fan brush, as below, I see broader strokes of light and shadow revealing the form in space. I look for curves, and I look for angles. 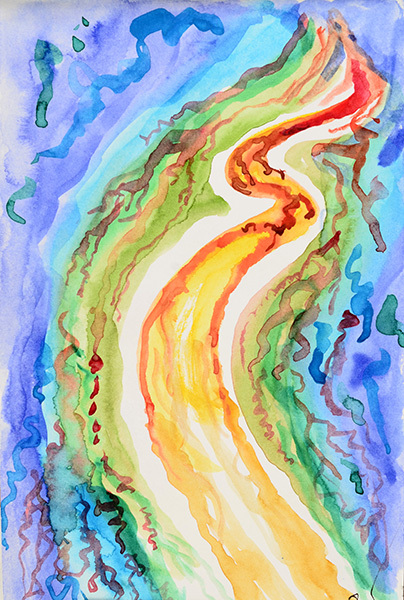 The form is constructed of flowing, rhythmic curves. The spatial arrangement of those curves is defined by angular connections. 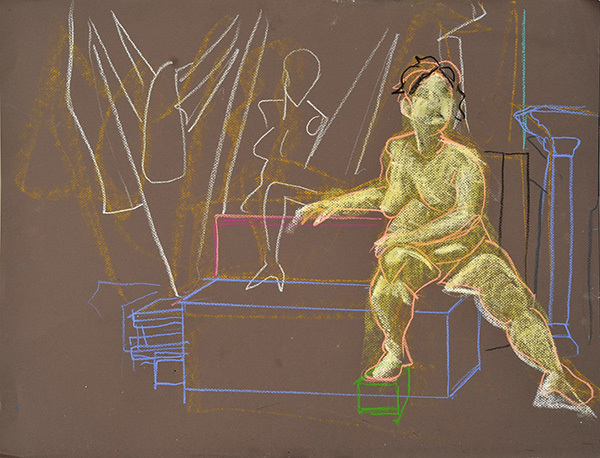 In drawing with a linear medium such as crayon or pencil, light, shade and color must all be translated into line. 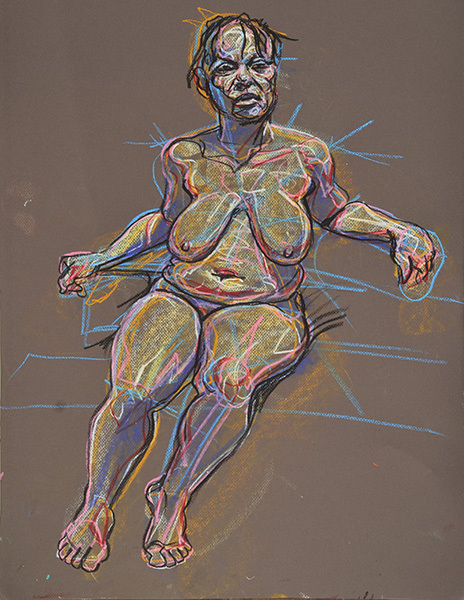 I imagine that I am drawing, not on flat paper, but directly on the body itself, so that every line follows the three-dimensional shape of the body. 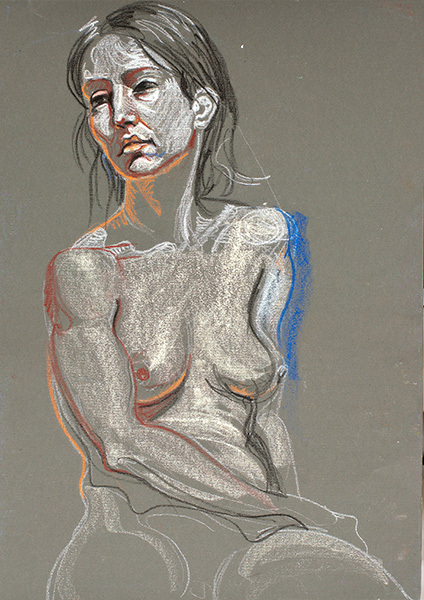 Notice the white serpentine line running from armpit to hip in the torso study below. It represents the center of a highlighted area, but its meandering reveals the subtle irregularities imparted to the surface of the skin by underlying layers of bone and muscle, as a raindrop snaking down a windshield shows the hidden undulations in seemingly smooth glass. Every glance is a fragment of perceiving. Every glance becomes a stroke in the drawing. It is a living process to record the phenomenon of life. When there is more time to develop a drawing, additional layers of perceptions build up as the artist looks at the subject again and again. Light, shade, color, reflection, absorption, space, energy, temperature, texture, gravity, vibration, growth and decay – all the phenomena of matter and of life can be found by looking and looking some more. Color and light in the real world are complex and slippery. Capturing such things is not a matter of simply duplicating a surface hue and value. Everything is relative, so everything must be seen relative to other things in the scene. As the work develops, the glances are comparative. What areas are redder than their neighboring areas? What areas are greener? A body exists in space, and the image in the drawing becomes more real as it develops a sense of space. Further glances look at the parts of the body as they intersect with elements of the background. I keep glancing, looking at light that reflects into shadows and light that penetrates the translucent skin and emerges tinged and diffused, looking at creases that swallow light and bulges that create specular highlights and gradients. To draw is to see seeing, that is, to experience in action all the processes that go into visual perception. The first post of Drawing Life was published on March 15, 2009, so the fourth blogaversary is upon us. I want to thank my readers, those that have been following since the start and those that have recently discovered the blog, those that subscribe by email and those that just check it out a few times a year. I just can’t help producing a constant flow of images – it’s my nature – but looking at the site stats and seeing how many people look in on what I post here, and especially receiving comments, motivates me to keep sharing with you through this forum. I invite you, dear reader, to tell me what you’d like to see more of here, questions you’ve wanted to ask me, or topics you think I should address. Please comment. 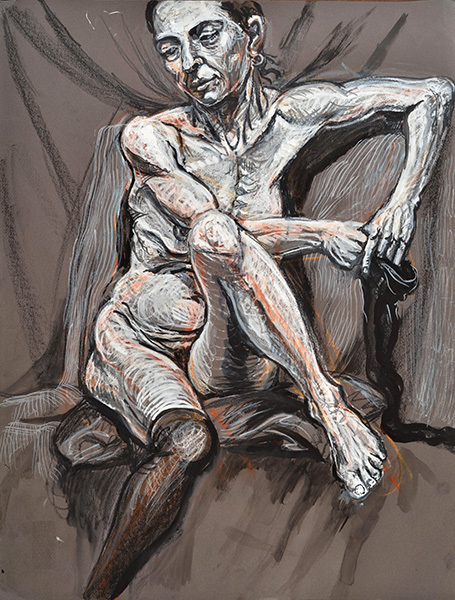 Some readers are mainly interested in figure drawing and art technique, some are interested in body art, others respond most strongly to the photographic visual essays, and still others to the art-historical surveys. For me, it’s all of a piece, all about my approach to visual art as a practice of self-development – a journey I have chosen as the central journey of my life, an effort to transform perception and a quest for mastery in an open-ended craft. I long ago discovered that I needed a core practice, a strong trellis upon which to cultivate my twisty vines. 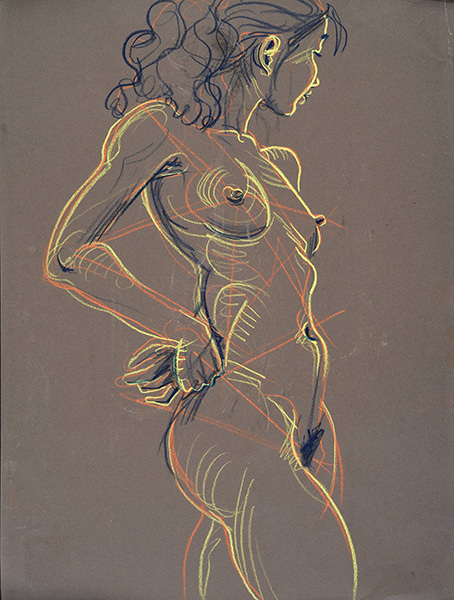 For me, that core practice is figure drawing. It provides me with an ideal combination of discipline and inspiration, self-measurement and freedom to explore. 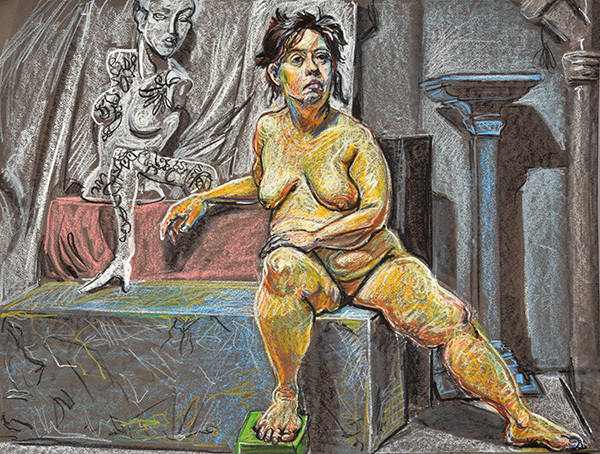 Looking back over the last six months of posts on Drawing Life I noticed it’s been a long time since I just posted an update on my recent figure drawing work, and I’ve built up quite an archive of unposted work in the past year – enough to explore various themes in separate posts. 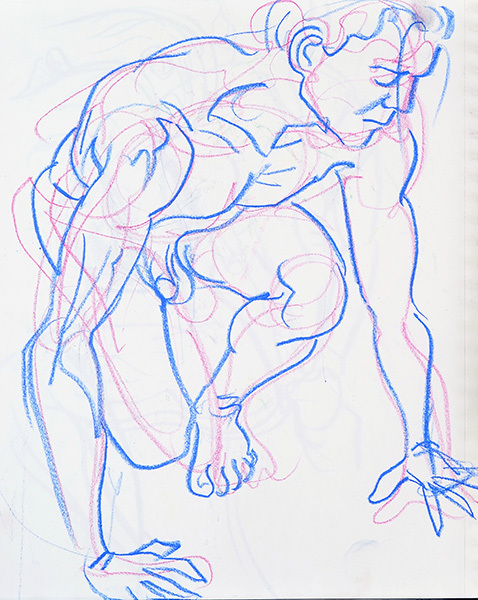 In my figure drawing practice I attend two regular weekly sessions, one of which (at Figureworks) consists of poses two minutes to twenty minutes in length, and the other of which (at Spring Studio) includes a single longer pose. Total drawing time on that pose, subtracting breaks, amounts to about two hours. 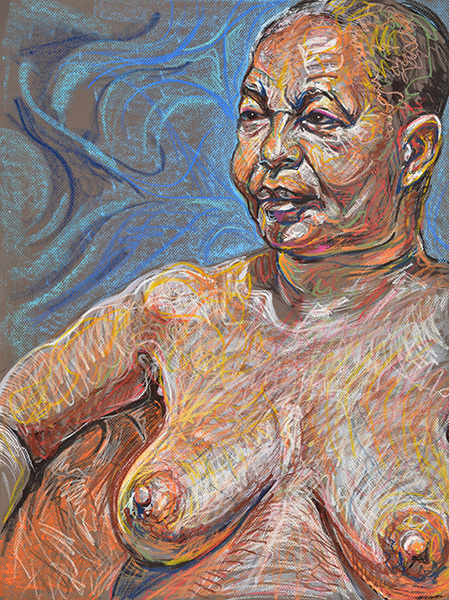 It’s enough time to do a fairly refined drawing, though I approach it differently at different times, sometimes focusing on capturing a likeness, sometimes looking at subtleties of color or shading, sometimes studying the relationship of the face to the body or of the model to the surroundings, or any combination of these things. Sometimes I get off to a solid start and keep working on one sheet of paper for the whole duration of the pose. Other times I do a sketch and then start over again for one reason or another. This post is a collection of recent pairs of rough, sketchy versions and more finished versions of the same poses. It’s a way of looking into my process. For each pair, my commentary will be inserted between the sketchy and polished versions. Often I start out studying the whole figure and then decide to focus on a cropped view. This pose has a strong diagonal through-line, from right foot to head, with the model’s left limbs acting as right-angled buttresses. After doing the sketch above, I decided I wanted to work larger to get more detail in the face, realizing that the diagonal tilt of the body worked in the composition without having to go all the way down to the right foot. In this case, the sketch was weak, but doing it helped to sharpen my perception for the more developed drawing. 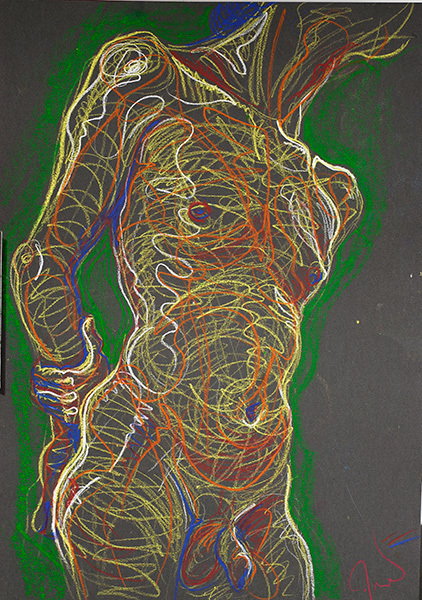 Here I felt the initial sketch was, in its rough form, a superb realization of my way of analyzing the figure, using curved lines to trace continuities of form, light, and body energy. Further developing the drawing above would have obscured the white energy lines, destroying a drawing that is simple and intense. In this case I stopped, not because the sketch was weak or flawed, but because it was excellent in its undeveloped form. 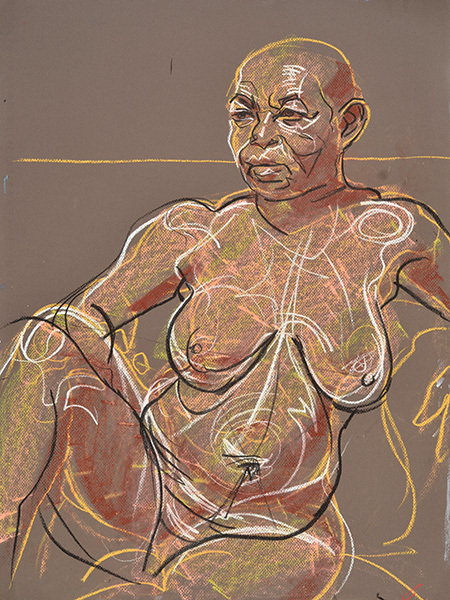 I went on to do the study below, applying most of my attention to the model’s face as an image of strong character and lived experience. I’m glad I stopped and saved the above version as a separate drawing, because it shows the robust, vibrant energy of the model’s abdomen, something that the second drawing omits. This is a wonderful model I’ve drawn many times before. For this pose, she set up an array of background elements and I decided to place her in this spatial context, with the blocks and boxes, hanging fabrics, and tattooed mannequin parts around her. In my initial sketch, above, I tried to get everything in the frame. Later, I decided to develop the drawing with the model more centered, omitting details on the left. But there’s something almost Matissean about the stripped-down, off-center composition of the rough sketch. This model, a fine artist in her own right, has the artist’s sense of what will make an interesting pose. She came up with this Schiele-esque pose, angular, fascinatingly awkward, casual and odd, with one stocking on and one hanging from the hands. This kind of pose is complicated and not easy to draw. I studied it in the above sketch for several layers of light and dark forms, angles and curves and cut facets, before attempting the realistic/impressionistic monochrome rendering, below. 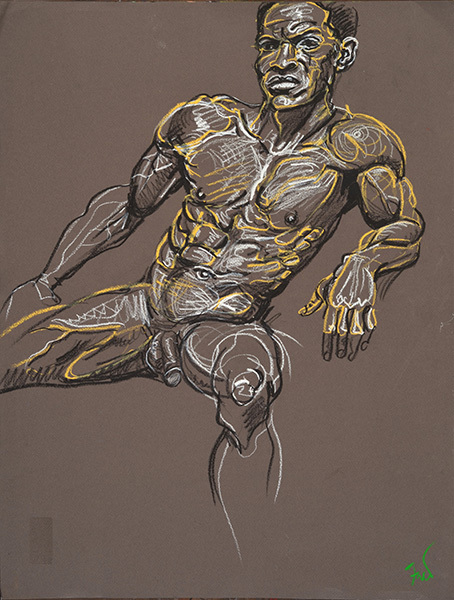 This model is a bodybuilder with incredibly defined muscles, and drawing him is an anatomical study. 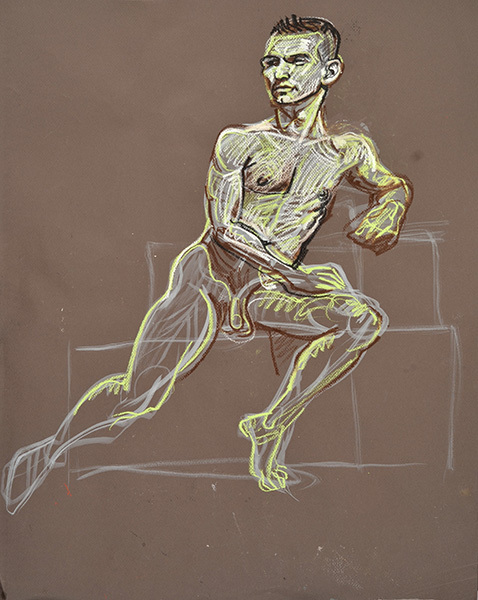 My initial sketch was an attempt to understand the pose, but I was craving more detail in the face and torso, and decided to develop the drawing in a vertical frame rather than the horizontal one with which I’d begun. This was a session I had to leave early because of a work obligation, so the second drawing here is less refined than some of the others in this post. Here’s another one where the sketch was too good to ruin by developing it, and I felt the model’s face needed more space to show its character. These two drawings need to be seen together. The sketch above shows the character of the body, and the sketch below shows more detail in the character of the face. There’s a limit to the paper size that can be used n the context of the crowded group session. Sometimes I wish I could draw everything in life size. This pair is done in my studio, not in the Monday morning long-pose session at Spring Studio, as are all the other examples in this post. Recently I’ve had an opportunity to work with the same model almost weekly in my own studio. I expect there will eventually be a post here about this experience. In my own studio I can work with dramatic lighting that is not practical in the group setting of Spring Studio, and can work directly with the model to refine the poses. 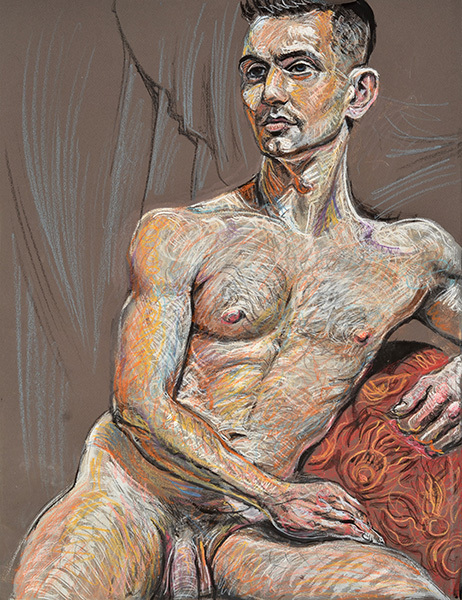 After doing the rough crayon and gouache sketch above, the pose was modified to paint the foreshortened view below. 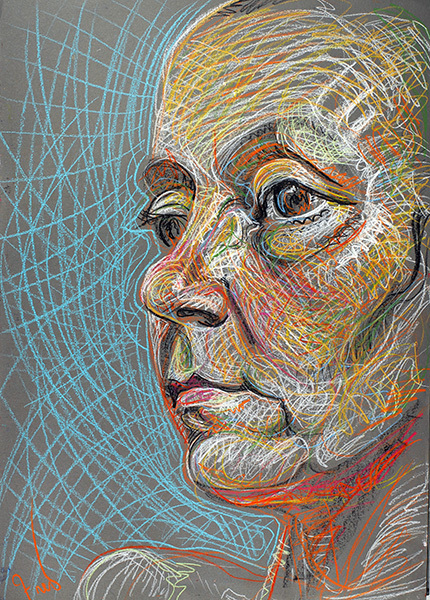 All of the original drawings shown in this post are roughly 19″ x 25″ (48 c 64 cm). 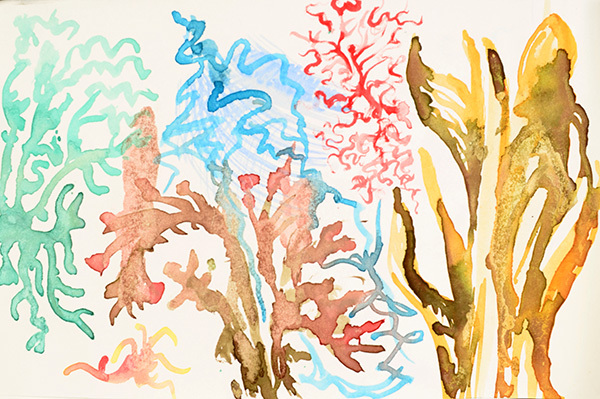 Some are drawn with Caran d’Ache aqruarelle crayons alone, and some are painted in gouache, combined with the crayons. 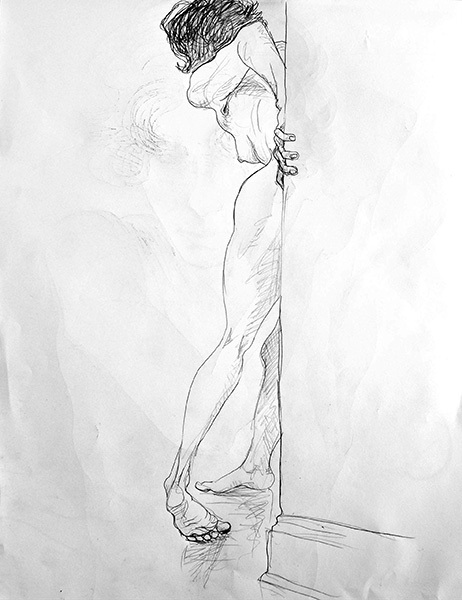 In last month’s post, “Working Big – Part 1”, I shared a selection of large figure drawings done at or near life-size. Over the last decade I’ve also been doing large-scale drawings with multiple overlapping figures. The cubists were trying to move beyond the limitations of the pictorial or photographic view by showing their subject from multiple angles simultaneously, suggesting the third spatial dimension not by the traditional way of projection or perspective, but by fragmentation. In these drawings, I’m fragmenting the fourth dimension, time, to bring it onto the plane and into the frame. 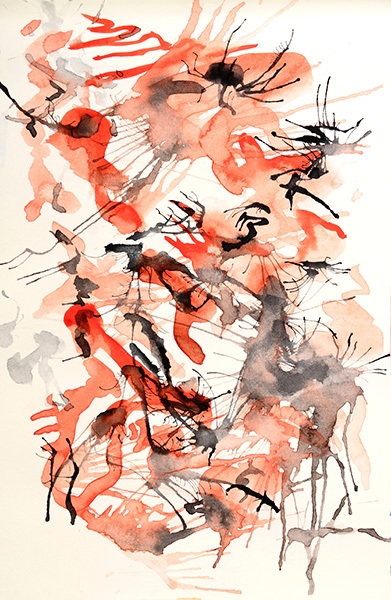 Chaos Compositions emerge from a two-phase process: first generating a chaotic field through a response to movement, followed by working to reveal order hidden within this chaos. 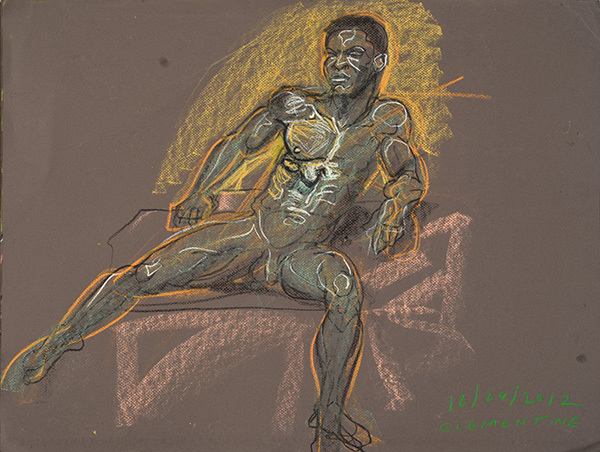 I work on the floor, crawling over the large sheet and covering it with overlapping sketches of movement or quick poses taken by a model-collaborator. 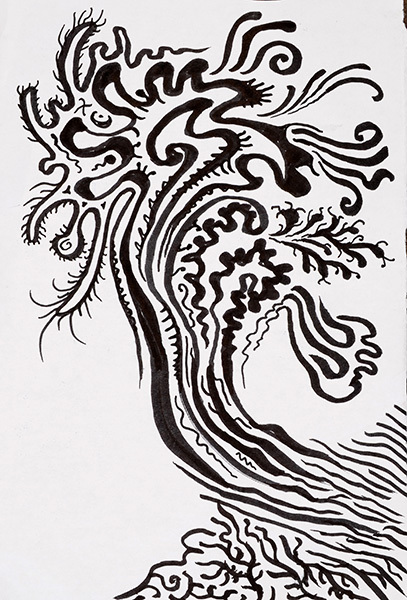 Once the drawing reaches a certain density, like a tangle of threads, I begin to work on carving a structure out of this undifferentiated energy field. I bring some of the layers of drawing forward by adding depth and weight to the forms, and push others into the background or into abstraction. I alternate between crawling on the drawing, where individual lines can be followed like paths, and standing back to get a sense of overall form and balance. What is expressed in these works is not a concept or a personal feeling, but something unconceived, a spirit that emerges from the moment, from the interaction of artist and model and environment. 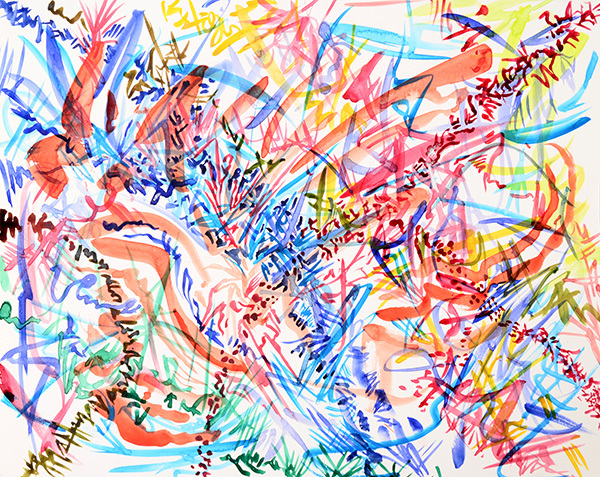 Several chaos compositions are included in the gallery “Time and Motion Drawings” on my portfolio site. Still more posts about this process are linked in connection with some of the drawings below. As you can see, I’ve written fairly extensively about this way of working, and you can follow those links to read all about it if you wish. Here I’ll just share a selection of these pieces, with some unstructured thoughts about what these odd drawings mean to me. Each model embodies a certain particular essence, a range of qualities that express the way his or her self and structure exist in the world. The curves of the body in all its different attitudes become waves in a field of energy. 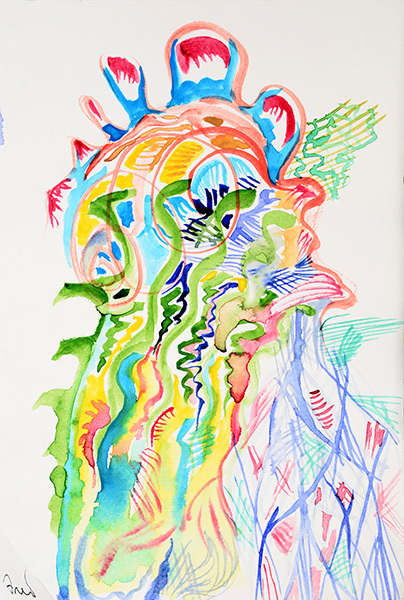 My drawing surface becomes a sensitive membrane that receives these vibrations. Each piece is a portrait of one model. These are not different bodies sharing a setting, but different moments exposed on the same emulsion. 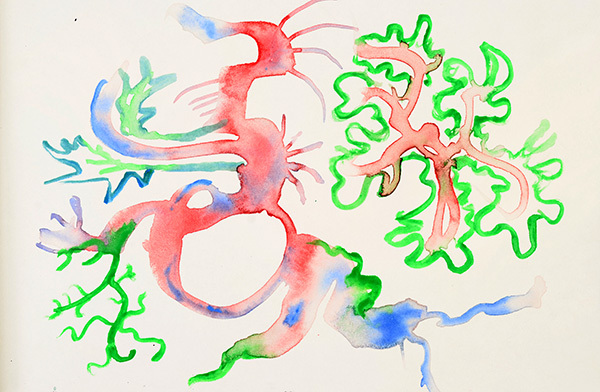 To look at these drawings is not to look at a picture, but to fall into a vortex, a field of chaotic forces. By finding and following the lines that define the overlapping bodies and faces, we find our way through the maze of the drawing. For me this experience is metaphorical, for in the field of forces that is the world, it is our own bodies and identities that ground us and give us continuity. 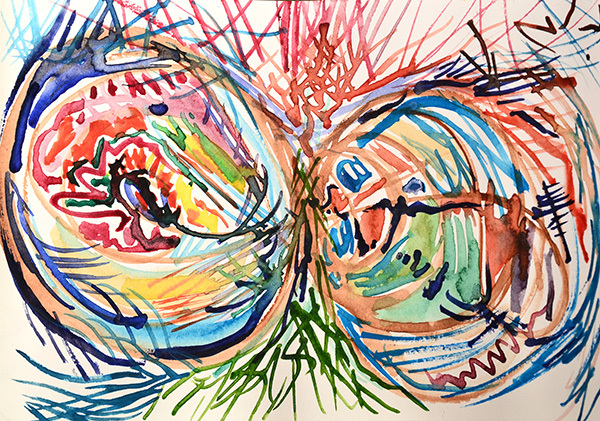 I want the viewer of these drawings to get some flavor of the experience I have when drawing them, an experience of surrendering to complexity but discovering clarity in the body and its life force. The chaotic nature of the world is inherent to its beauty. Geological and biological forms, clouds and galaxies, grow out of the infinite complexity of interacting energies and interdependent beings. To grasp the universe is to lose the self in the moment. It is an experience I seek again and again, with a crayon in my hand. I don’t tell my models how to move, but let them find their own poses. I am not concerned with realistic rendering, but with the qualities of the curves and the forms of energy they seem to call up from the potent void of negative space. I am attempting to see beyond the surface of things. When I am drawing, I am close to the large paper and cannot see the overall pattern. I am down in it, exploring whatever passage I have found for the moment. Later, looking at the drawing from a distance, I see it abstractly, as veins of color in a crystal, or as objects in a whirlwind. 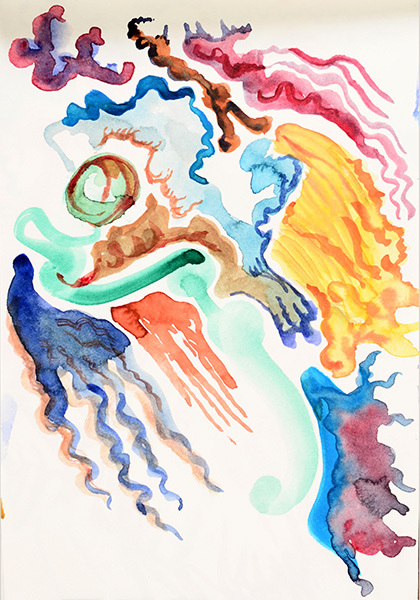 Then the eye discovers a face or part of a body, and that is an opening into the image, which can be traveled like a path through the woods, or like a strand of thought through the din of the chattering mind. 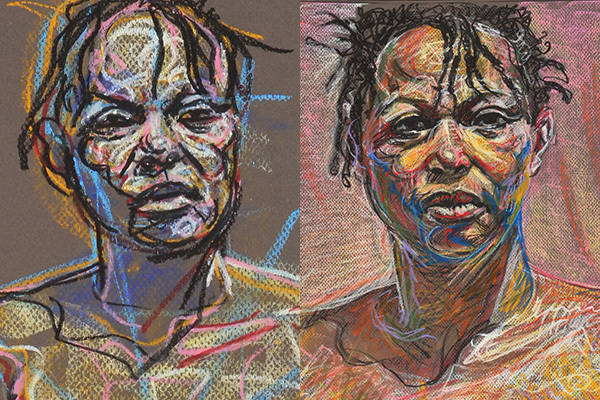 These works, even more than my other drawings, are products of close collaboration with great models who share their own creative expression in the work. The models who posed for the large drawings in this post are Kuan, Pedro, Stephanie, Jillian, Madelyn, Neil, Milvia, Jeremiah, Kristin, and Jessi.